I finally popped my cherry. The crumble cherry actually. So, I have a confession to make. It’s a confession that breaks all British traditions and shatters all illusions to my own basic baking repertoire: I have never (until now) baked a crumble. This basic staple that stands side by side with Scotch eggs and Jam Turn overs in Home Economics never appeared so, alas, it went unbaked. Can you believe that for the years I have been on this earth I have never, ever made a crumble until this summer?! One of the easiest, most simply marvellous British staples that gives your heart that warm fuzzy feeling, and I have never even attempted it before. 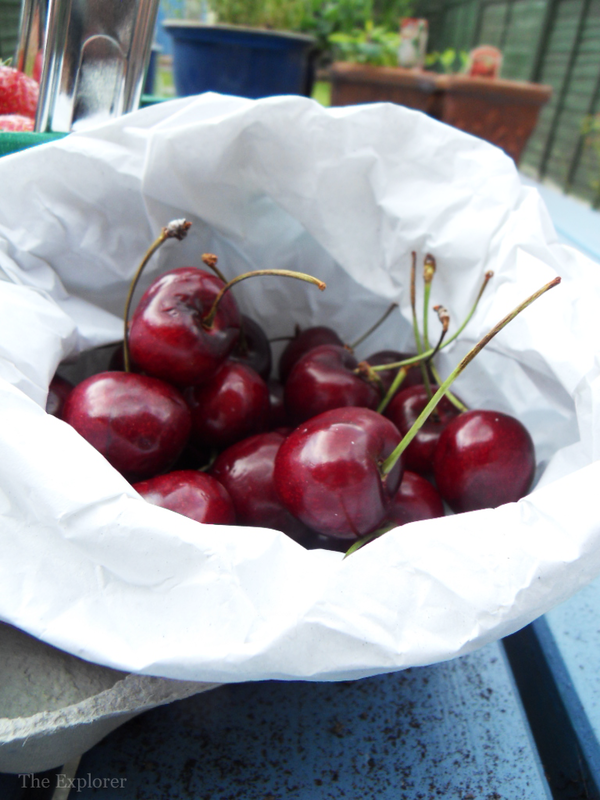 It was the cherries that made me do it. It's cherry season and they are currently at their best. 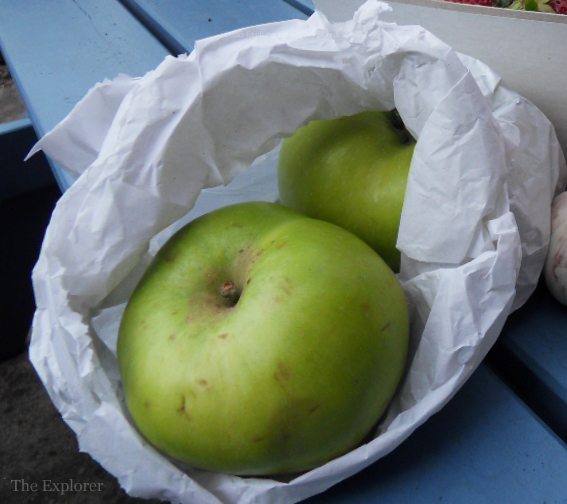 They were sat, cheekily drawing my attention, next to the biggest Bramley Apples I think I have ever seen. Mr M took to complaining that we never have crumble so the "Oh, sod it" came out and with a little Explorer shaped twist soon enough a crumble arrived fully formed and seasonally divine. There really is just something about the British seasonal food scene that makes me a little bit proud. This time of year is, for obvious reasons, the best time for seasonal stuff and boy can you tell. When it comes to seasonal you need to go hard or go home. I don't bother with supermarkets for seasonal, it's all about the independents for me, it's all more natural and genuinely taste better! Anyway, if you fancy giving this baby a try you can find the recipe for it below. 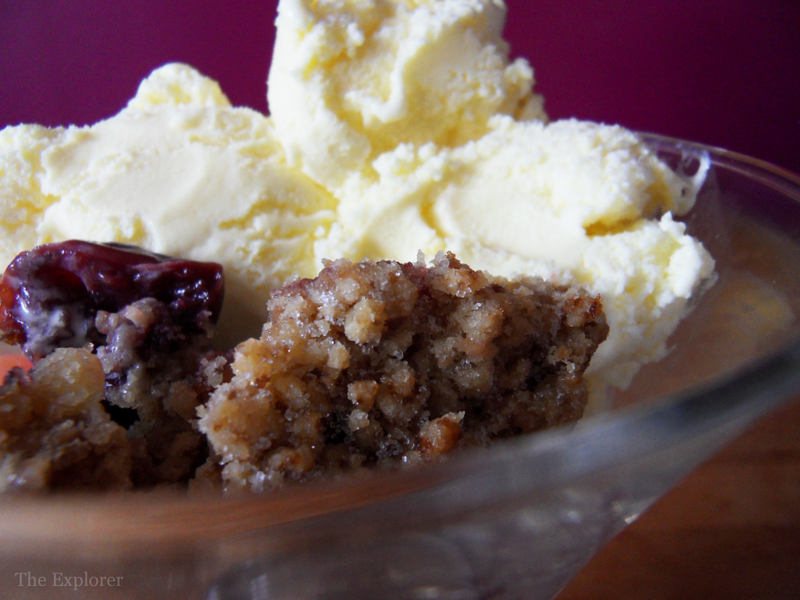 As a non-crumble fan this is a pretty damned fine one - especially with vanilla ice cream (ooomph! ), even if I do say myself! Go get your apron and GET READY TOOOOO CRUUUUUUUUUUUUUUUMMMMBBBBBLEEEEEEEEEEEEEEEEEEEEEEEEEEEEEEEEEEE! Peel all of the apples, chop them, into chunks, cover them in a little lemon juice to stop them from browning, sprinkle over 1 tablespoon of the light brown sugar. Add a table spoon of water, get you hand all involved and mix it all together. Pop in a oven proof dish. Tray and make sure they are an even layer. Whack in the oven for 5 minutes whilst you sort out your cherries. If you have fresh cherries, half them and remove the pip. Whack them into a pan with a tablespoon of water and the tablespoon of honey. If you are using tinned put the cherries in the pan with about a tbsp. of the syrup, I avoid the honey as they have already been in syrup. Heat until just warmed through and soft. Drain the cherries, keeping the spare juice in the pan to one side. Add the cherries to the slightly soften apples. Add last tbsp. of brown sugar. Leave to one side whilst you make the crumble. Put flour, cold butter and granulated sugar in a bowl together and rub with your fingertips until it all looks a bit breadcrumb-y. Once you have the right consistency sprinkle in half of the muscovado sugar. Now add your mix on top. Take three quarters of your crumble mix and spread it over the filling. 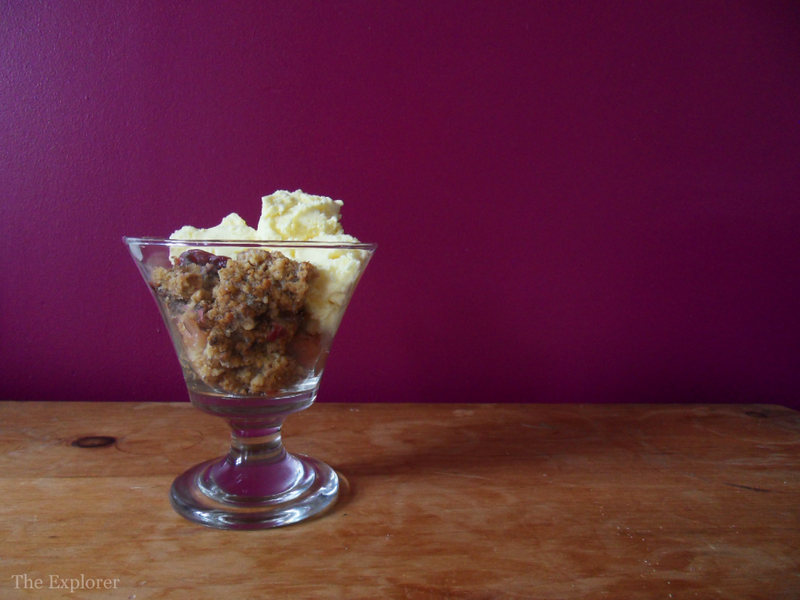 Depending on how you like your crumble (I was reliably informed that people have crumble preferences) compact – or don’t – compact your topping down. 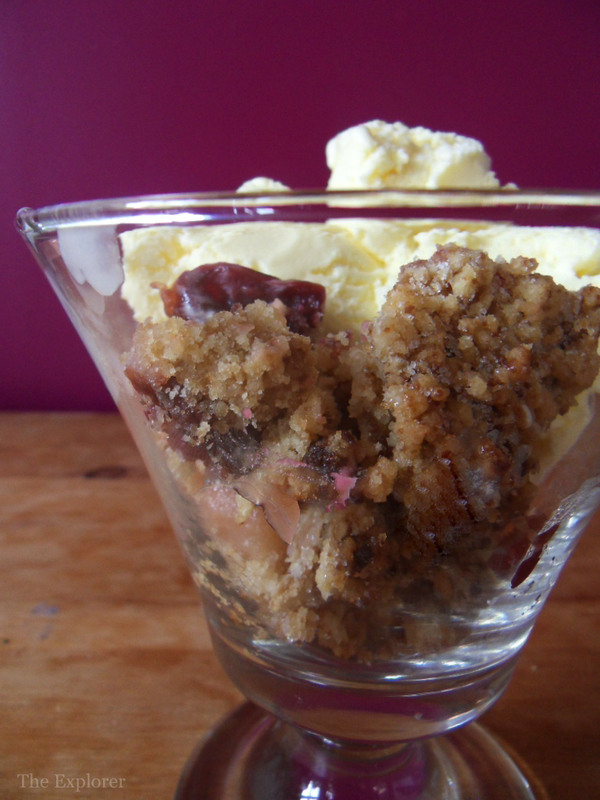 We had slightly compacted….not enough to undo the crumble, but just enough for it to hold together. Now with the rest of your topping add in the rest of your muscovado. Sprinkle the rest of the topping on top of the crumble, leaving it reasonably loose. Whack it all in the oven for 45 to 50 mins. Watch your topping – it may brown fairly quickly, if it does cover with foil for a bit. Once again, depending on your preference serve it straight from the oven, let it cool for an hour or so, so it is just warm, or let it cool completely. Have with anything that is creamy; ice cream, cream, whipped cream, or custard. Any way you like it, serve it, but it is imperative that you serve it with lashings of let’s get ready, I said a-let’s get ready, I said a-let’s get to ready Crumble! Mmmm I love crumble, but I've never made my own either. This ones sounds great! Thanks! Crumbles are super easy, definitely great for a quick fix.